Soak-Up Premium Absorbent enjoys widespread use as a low cost, lightweight absorbent and dehydrator for the cleanup, solidification and disposal of liquid waste. It flows well, eliminating voids or free standing liquids, while its lightweight property reduces landfill and transport fees. Additionally, Soak-Up Premium Absorbent is both chemically neutral and asbestos free. It will not shrink, degrade or over bulk – distinct advantages over most other conventional spill absorbents. 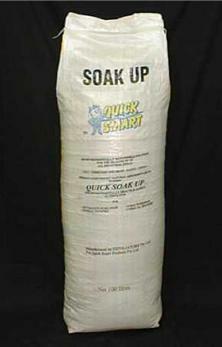 Soak-up Premium Absorbent is a unique mixture of two naturally occurring minerals, one being hydrated phlogopite mica, the other a siliceous rock. Both of these minerals expand up to twenty times their original size/volume when heated to above 1000°C. During heating, the particles expand to form extremely lightweight granules covered with multiple cavities. This extensive surface area configuration provides outstanding absorptive capabilities in liquid matrices. Soak-up Premium Absorbent, unlike other absorbents, will soak up all chemical spills other than Hydrofluoric Acid. Once used, the contaminated vermiculite should be shoveled into a suitable receptacle and sealed for disposal in accordance with EPA regulations. These spills include Hydraulic Oil, Cutting Oils, Emulsified Oils, Diesel, Machine Oil, Engine Oils, Acids, Paints, Alkalis, Resins, Sludges, Petrol.